Our luxurious silkening formula, blooms with an exotic fragrance of coconut oil & cocoa butter. It absorbs instantly to deliver strand-by-strand softness, long-lasting smoothness & shine without greasiness. Apply a dime-size amount to damp or dry hair and distribute through hair and at the ends. Do not rinse. Extracted from cocoa beans native to West Africa, Cocoa Butter is well known for its nourishing qualities in hair and skin formulas (not to mention its delicious scent). The smoothing balm is also renowned for taming frizz and flyaways. Coconut Oil is one of the most penetrating natural oils there is. With super hydrating properties, it's ideal in formulas that help combat frizz, prevent damage, and boost smoothness and shine. Everything you need to complete your Smoothing hair care routine. Rated 3 out of 5 by KSRosebud from Awesome Product - Bottle needs Changed I love the smoothing oil. I've used all of the coconut products and my hair is healthier than its ever been .... BUT please redesign the bottle. It's so difficult to hold and pump out. I've actually had to put it in a bottle from your competitor because it's much easier to use. Rated 5 out of 5 by nighesha from Whole Blends At first I was kind of skeptical of this product because of the others that I have used for my hair that didn't work. Whole Blends provd to be different from the others. It proved itself on the hottest days of summer. I am extremely happy. I will definitely recommend this to everyone I know. Rated 5 out of 5 by Lornamurray from Great For Curls! 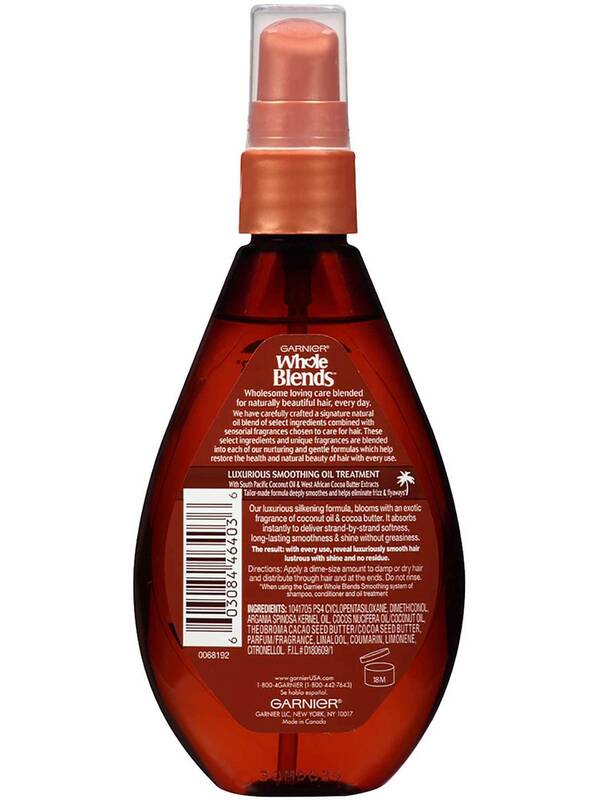 Garnier Whole Blends Smoothing Oil works so great on my curls! It's stops them from frizzing out, but is light enough so I can keep all that volume that I love! It's so hard to find a product that adds shine and seals in moisture at the same time, this luxurious smoothing oil treatment does the trick! This a great product for my curly hair type. Also, the pump dispenses the perfect amount of product and doesn't make a mess. Rated 3 out of 5 by Melweitz from It's just ok I have used this hair oil on both wet and dry hair. And my hair is big, waver and curly, frizzy at times. This really does help on my hair when it's dry and gets too fluffy. It will help smooth out the sides in between washings. When I use it on when hair I find that my hair gets very greesey much sooner than it usually does. I only apply 1 pump to my ends too so not anywhere near my roots. It's good to have on hand for emergencies but I'm nkt sure I would buy again. Rated 4 out of 5 by Learaujo from Almost frizz free By using Garnier Whole Blenda oil, I did feel a big difference towards my frizzy hair. Usually when I wash my hair, I can't just leave it as is because it gets insanely frizzy. By using the smoothing oil I felt a great diffence, even if I only use it every other wash. The tricky part is to be careful not to over use it otherwise my hair gets very oily. It smells very pleasent making it a good oil to use every time, I find that some hair products are too strong, wich bothers me and probably other people. I will continue using it and recommend it to others. Rated 5 out of 5 by wible25 from Great smelling smoothing oil I have been putting this oil through my hair after I shower. I normally do it from my ears down and it never weighs my hair down. I like how my hair looks and feels for the next few days. It does help with flyaways and keeping my hair very soft. It also has a pleasant coconut smell which I enjoy. My husband really likes the way my hair smells too. Rated 4 out of 5 by Samar3323 from An Absolute Must Try From the first pump, I could feel the potential for ultimate hydration, calming my unruly hair. The consistency was more like that of an oil rather than a thick serum. I am usually weary of products with cocoa butter, as they tend to be overwhelmingly pungent in scent. I was pleasantly surprised to discover that the level of fragrance was very mild. Upon application, the product was easily absorbed by my hair and left no residue. 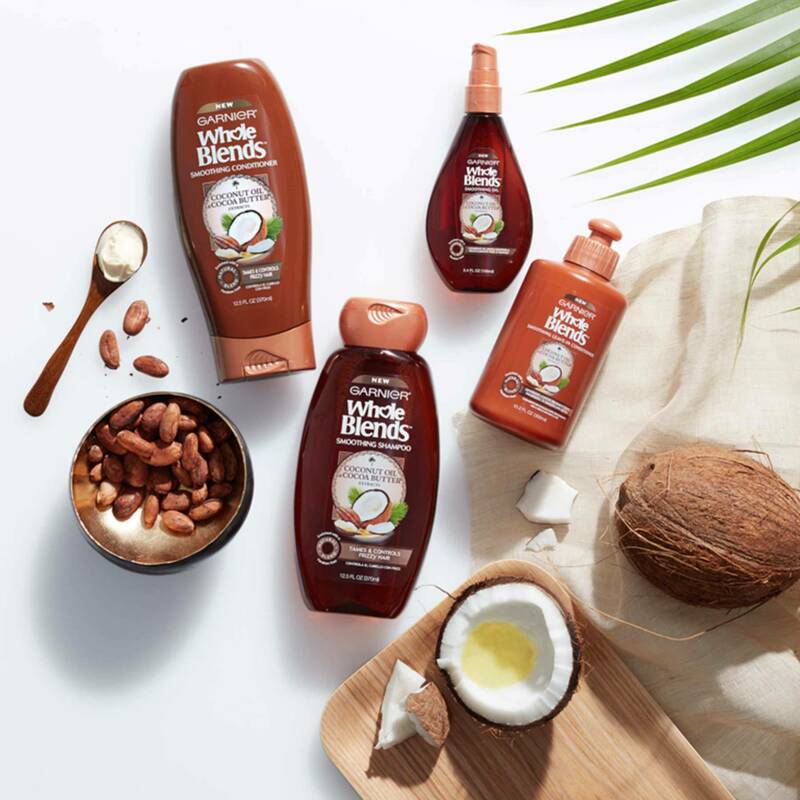 It can be challenging to find a product that smooths and hydrates without leaving your hair feeling heavy and weighed down, but Garnier has created the perfect blend to avoid that. I have very curly hair and this product absolutely helped to keep my locks under control. I will repurchase in the future. Rated 5 out of 5 by etoiles from Wow! Exceeded expectations! 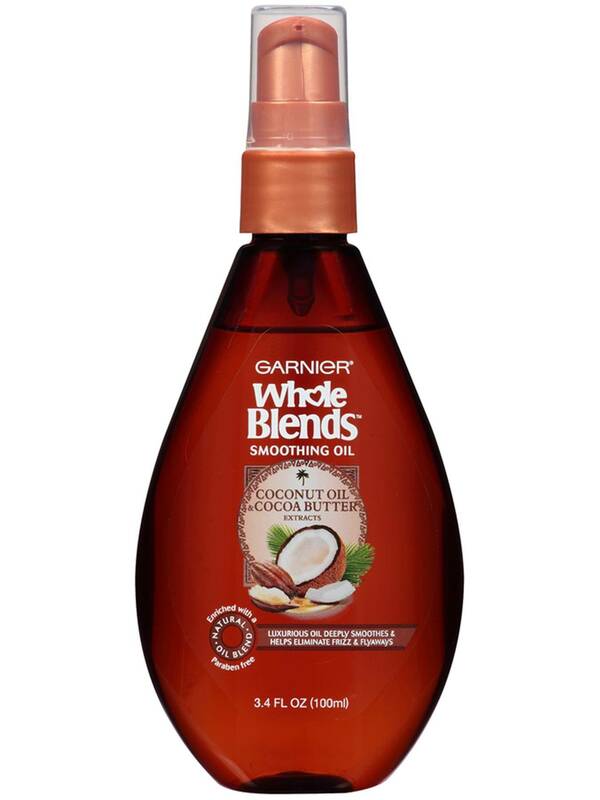 I was skeptical before trying Garnier Whole Blends Smoothing Oil. While my hair isn't greasy it's not dry like straw either so I thought it would make it more greasy. I also like to wash my hair every other day so I didn't want to have to wash it more often because of the Oil. Well, this product did none of those things! My hair didn't get more greasy looking and I didn't have to wash it more often. What Garnier Whole Blends Smoothing Oil did was make my hair less frizzy and stay more smooth and keep it's style throughout the day, even in high humidity. I also loved the coconut smell of it! My husband loved the smell as well. I had never put an Oil in my hair and I wasn't sure if it would work but I loved it and will keep using it!